1. 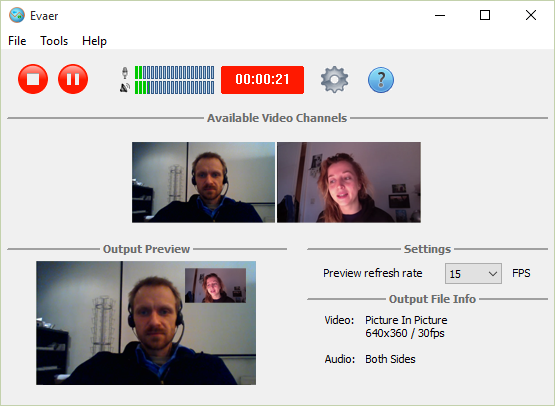 Preview the output video while recording Skype video calls – It means “What You See Is What You Get”, that you can see the video call recording result immediately without waiting for the end of the recording. To preview your video when you recording the Skype call that just need to turn on the “Enable video preview when recording video streams” option at Evaer Advanced settings. This entry was posted in Skype Video Recorder and tagged Preview the recording Skype video, Preview video, Record Skype Video Calls, Skype Recorder, skype video call recorder on September 12, 2015 by admin. 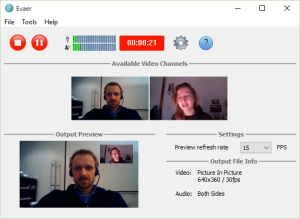 In the latest version, we optimized Skype HD video recording. Making it use less CPU resources when recording Skype HD video calls, especially 720p and 1080p video. Free download the latest version of Evaer Skype video call recorder to enjoy an enhanced experience now. This entry was posted in Skype Video Recorder and tagged record Skype HD video call, Record Skype video 1080p, Record Skype Video Calls, Skype HD video recording, skype video call recorder on February 21, 2014 by admin. As we know by now, Skype will automatically adjust the video resolution and aspect ratio to the maximum depending on the available Internet connection and CPU capabilities on both sides of the conversation. For example, if you have an HD webcam, Skype will evaluate the above-mentioned conditions between the conversation. If conditions are good enough you’ll get an HD video call using 720p & 16:9 . If condtions aren’t good enough, you call will be in 480p or lower but definitely in 4:3. The recorded video images maybe get distortion if you always use the same aspect ratio. So, we have released a new version that has added the new feature — Self-Adaptive video resolution and aspect ratio. This new feature will auto-detect your Skype video calls video resolution and aspect ratio, then record it use the same video resolution and aspect ratio automatically. This will avoid the video images distortion issue. Now, the latest Evaer video recorder supported video resolutions are 240p, 360p, 480p, 720p, 1080p and the aspect ratio are 4:3,16:9. This entry was posted in Skype Video Recorder and tagged Record Skype Video Calls, Self-Adaptive video resolution and aspect ratio, Skype video calls recorder, Skype video calls resolution and aspect ratio on August 9, 2013 by admin.